when a boy I lived only one block from the late Guatave Vhlteheaa. my father's business having been lo- cated for over thirty years on Spruce Street, while Mr. Whitehead lived and did most of his experimenting on Pine Street. Naturally, boy fashion, I was greatly Interested In what Mr. Whitehead was doing, spending a great deal of my time there, both after school hours and during va- cations. and he explained much to me about flying naehlnea* Many and many a time I have watched him test a plane while It traveled around and. around. In a circle, these tests talcing place In his yard. with the plane tied by a rope to a stake which had been driven Into the ground, the yard being so small that the plane would, have had to have been dismantled In order to have tested It elsewhere* During these tests the plane would rise from three to five feet off the ground. 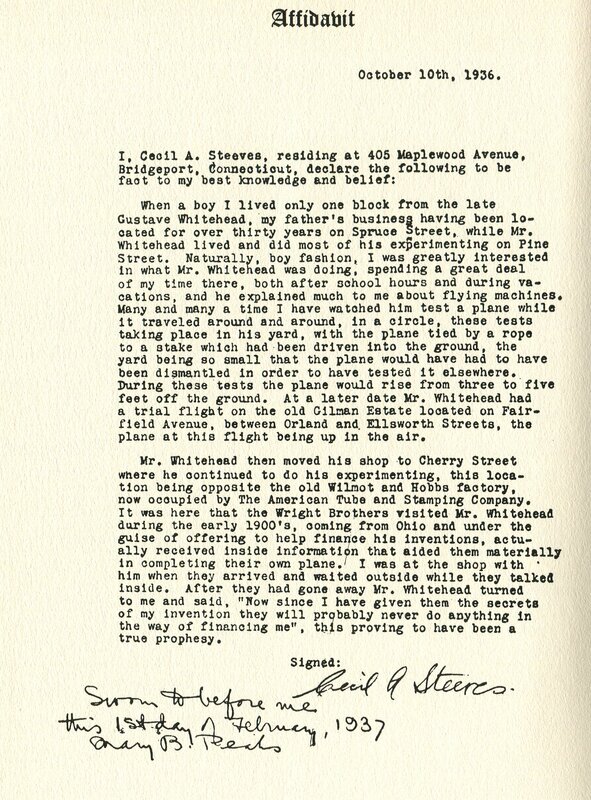 At a later date Mr. Whitehead had a trial flight on the old Oilman Estate located on Fair- field Avenue, between Orland and. Ellsworth Streets, the plane at this flight being up In the air. Mr. Bhitehead then moved his shop to Cherry Street wnere he continued to do his experimenting, this loca- tion being opposite the old Wllnot and Hobbs factory, now occupied by The American Tuba and Stamping Company. It was here that the Vrlght Brothers visited Mr. whitehead daring the early 1900'3, oonlng. from Ohio and under the guise of offering to help finance his inventions, actu- ally received inside Information that aided them materially In completing their own plane.' I was at the shop with him when they arrived and waited outside while they tallcel inside. After they had gone away Mr. Whitehead. turned to me and said, "Mow since I have given there the seoreta of my invention they will probably never do anything In the way of financing me", th}s proving to have been a true prophesy.